EXCELLENT ALL AROUND! VERY HOT DURING OUR VISIT SO APPRECIATE THE FANS. THOUGH THERE WAS NO OCEAN BREEZE SO AT SOME POINT EVERYONE WILL NEED TO ADD AC. SUGGEST BETTER BEACH TOWELS, KINDA SMALL, AND ADDING BETTER BEACH CHAIRS. 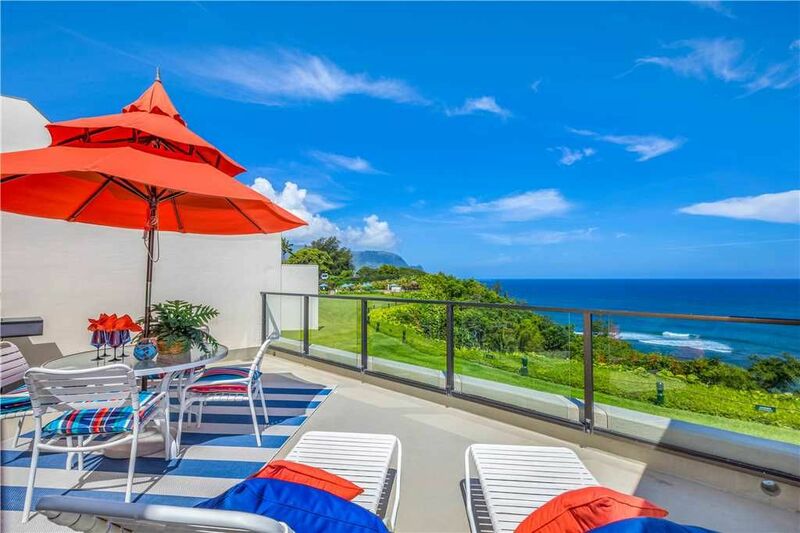 GREAT VIEWS AND LANAI'S! DEFINITELY RECOMMEND. Aloha Paul, and mahalo for your comments. We're sorry the trade winds weren't blowing during your stay, but we're glad you enjoyed our home. We hope you'll take advantage of our 10% discount for repeat guests and visit our beautiful island again! Aloha, and mahalo nui loa for your review! Let us know when you're ready to return to our beautiful island, and we'll discount your rent by 10% as a repeat guest. Aloha Ron, and mahalo for your comments! We're glad you enjoyed your stay, and we hope you'll return to our beautiful island. Beautiful place for a relaxing vacation! This rental was absolutely perfect for my family! We were traveling with 4 adults and a 2 year old, and this property offered plenty of space for us. The views are amazing!!! The area is quiet, and we didn't hear the neighbors at all. We were able to walk to the Hideaways Pizza Restaurant and the St. Regis. The beach in front of the St. Regis is beautiful and quiet, and had safe swimming for the baby. Haneli Bay, shopping, Foodland (grocery) are all a very short drive away. We loved this location and are already trying to plan our next trip! Aloha Victoria, and mahalo nui loa for your review! We're very glad that you enjoyed your stay and appreciated the spaciousness of the condo and its convenient location on the beautiful north shore of Kauai. We offer a 10% discount to repeat guests, and we hope you'll visit again! Aloha Mary, and mahalo for your review! We're glad you enjoyed your stay and the convenience of the condo's location. We're sorry about the warm weather during your stay, but most homes on Kauai don't have air conditioning as the climate is usually milder. We offer a 10% discount to repeat guests, so we hope you'll visit our beautiful island again! We just returned today from our 5 night stay at Pu'u Poa #208. If you are thinking of staying here book it now! You will not regret it. Husband and I had the most wonderful stay in this beautiful and immaculate condo. We hardly went out at night as we enjoyed the most spectacular sunsets from our lanai and did not want to leave. Slept so well as the king size bed was so comfortable and hearing the ocean breaking on the beach below was hypnotic. Our last night was spent on the lanai watching the sun, sipping wine, eating our take-out sushi and listening to the provided Hawaiian music on the CD player. I wouldn't have changed a thing. It was more expensive then we were originally budgeting but have NO regrets for upgrading to this condo. Would do it again in a heartbeat. When we go back to Kauai I hope this unit is available. It had everything, towels and snorkeling equipment too. Location was perfect and I would stay here over the St. Regis (immediately next door) any day. It was an easy process to book and get all information. Do not hesitate to pull the trigger on booking #208 it is so worth it and my review doesn't even come close to expressing what a wonderful time we had here. Aloha and Mahalo for sharing your very special place! !